Roger Williams, on the other hand, was a great man, and his concept of separating worldly and godly realms is, even today, anticipatory of changes yet to come in countries that still have official state religions. Using science as a guide, many of the great discoveries were actually the product of a race between competing scientists. If Darwin hadn’t published when he did, Wallace would have beaten him to the punch. (Actually, Wallace did just that, but in a paper of decidedly modest size and scope, in comparison to Darwin’s “On the Origin of Species.”) There are many similar examples from many branches of science and mathematics. It’s almost a case of an idea whose time has come. But Gregor Mendel was years ahead with his findings in what we now call “genetics.” He died years before anyone paid the slightest attention to what he had discovered. The world was not ready for Mendel in 1865, but was more than ready in 1900, when his work was simultaneously rediscovered by three different scientists working separately. So the question is, if Roger Williams hadn’t established a colony based on religious freedom and a secular government, when would that have occurred? Is it the case that prophets are not only without honor in their own land, but are also without honor in their own time? Had the world been more ready for Roger Williams in the 1630s, would he be better known (and far more lauded) today? Or was his problem that he established Rhode Island and not, say, California or New York? Is it simply that people believe no big idea can come from a very small state?" 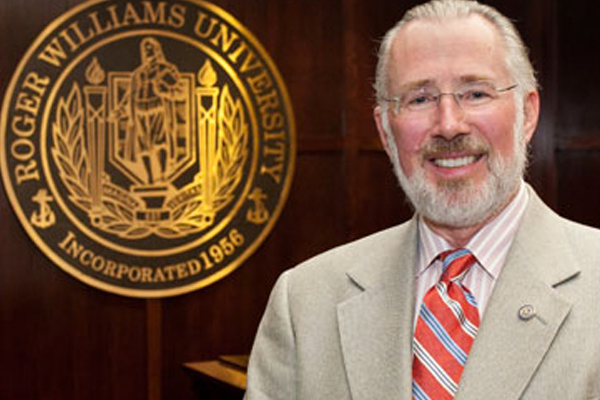 With more than 40 years experience in higher education including 11 as a full-time faculty member, esteemed educator, scientist and attorney Donald J. Farish, Ph.D., J.D., became the 10th president of Roger Williams University in June 2011.